James William Newman Jr, BM3 Cam Ranh Bay ?Detroit, MI? 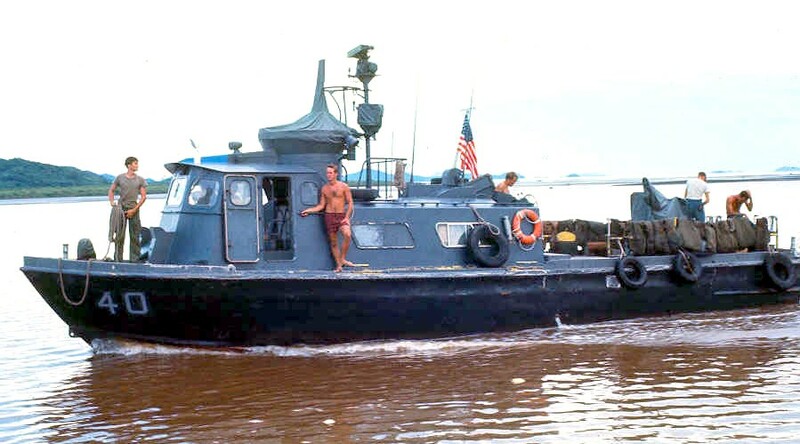 - On 2 April 1966, PCF 31, 32 and 35 thru 41 arrived in Cam Ranh Bay, from Subic Bay, PI, onboard the USS Catamount LSD 17 and the following day made the 170 mile transit to Vung Tau to become part of the new Boat Division 103 at Cat Lo. - On 28 February 1968, while conducting a naval gunfire mission that had been requested by sector authorities, PCF 40 received heavy automatic weapons fire from the beach approximately 38 miles south of Saigon. The Swift boat sustained one hit which caused slight damage to the boat and no personnel casualties. The extent of enemy material and personnel casualties was unknown. - 17 March 1968, in a further experiment to improve hull design, PCF 40 was fitted with a new heavy weather bow, an effort to make the boat more seaworthy in heavy seas. During evaluation by the Naval Research and Development Unit at Cat Lo, it was proven to be unsatisfactory and subsequently removed during the December 68/January 69 in-country overhaul at Cam Ranh Bay. Note: This is the best and only picture of this configuration I have ever found ... so use your imagination and see how this was doomed from the very start! - On 6 June 1969 boat transferred from Cam Ranh Bay to Cat Lo. - On the afternoon of 24 June 1969, PCFs 21, 52 and 40 with VNN PSYOPS team embarked, patrolled west on the Cua Lon River. Upon reaching the Rach Ong Trang, two VC flags were sighted and PCF 40 entered the canal while the other units provided cover. Two B-40 rockets passed over PCF 40 and only one detonated. The Swifts suppressed the fire with unknown results. Two VC propaganda signs were later sighted which read "We kill Americans". Vietnamese soldiers stay out. An incident on 29 June 1969, marred the otherwise uneventful four days of psyops campaigns as Operation SEA FLOAT continued. A command detonated mine exploded in an abandoned sampan which PCF 52 was investigating, about six miles northeast of Nam Can. There were no personnel casualties but the Swift sustained five broken windows and minor damage to it's fathometer. - On 9 August 1969, a SEA FLOAT mission was conducted with seven PCFs, USS Gallup PG 85, USS Asheville PG 84, EOD and UDT Detachment G, MSF troops and Seawolves participating. 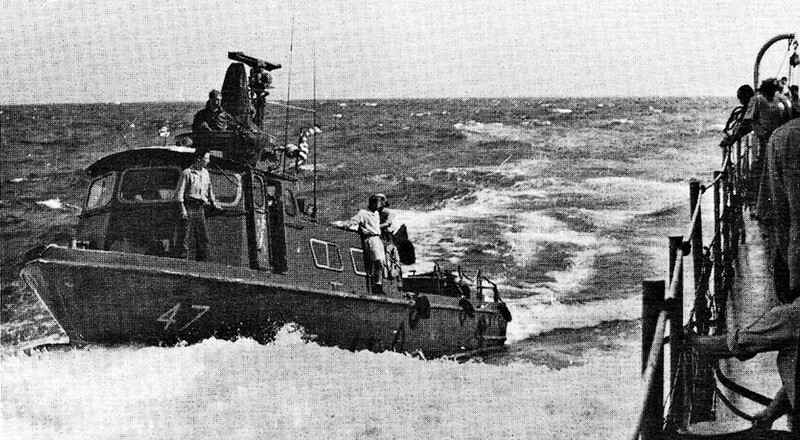 The operation commenced with the Swift boats inserting the troops on Rach Ba Than and Rach Buong, about five miles east of Seafloat for sweeps south. During a day of frequent contact PCF elements were ambushed on five separate occasions with rockets, small arms fire and a mine, resulting in PCFs 5, 40 and 31 receiving minor damage. One US sailor and three MSF troops were wounded. The ground troops later swept the ambush areas and captured 58 booby traps, two large charges, 60 Japanese knee mortar grenades and three hundred rounds of ammunition. Ten bunkers, three structures and one barricade were destroyed and two VC were killed. - While set in a WaterBorneGuardPost on the Vinh Te canal, 12 February 1970, PCF 40 took one (1) B-40 rocket hit, at the waterline of the port bow and into the forward berthing area. PCF 40 put up suppressive fire and departed the area, due to fire and flooding. Action resulted in one (1) VNN crewmember slightly wounded. - While moored alongside the USS Krishna ARL 30, at SEAFLOAT, on 6 July 1970, PCF 40 was damaged, and one (1) crewmember killed, when a tremendous explosion, caused by an underwater mine, ripped a 17'x20' hole in the side of the Krishna. - On 22 May 1966, while on patrol in the RSSZ in support of U.S. Army Operation LEXINGTON III, PCF 41 came under fire from a heavy caliber weapon on the east bank of the Dinh Ba River. A hit was sustained in the lower half of the starboard bulkhead of the pilot house, killing the coxswain, wounding the radioman and destroying most of the equipment in the pilot house. Within seconds of the initial hit, a mine exploded adjacent to the PCF, resulting in possible bottom damage. PCF 41 returned the fire and accelerated at maximum speed. However, steering control had been lost, and the boat ran aground before control could be regained. The Viet Cong attack terminated soon after the PCF went aground. The radio had been damaged in the attack, and efforts to re-establish communications were unsuccessful. Mortar illumination shells, .50 caliber tracer ammunition and searchlight were all used in an unsuccessful attempt to bring assistance. Due to location of the craft in VC territory, impending darkness, lack of radio communications, and an outgoing tide, PCF 41 was abandoned after jettisoning the after .50 caliber machine gun, the URC-58 radio and some of the ammunition. The life raft was then launched and the crew, equipped with small arms, proceeded southeast until picked up by PCF 37. The one wounded man was then transferred to Dong Hoa Village for helicopter medical evacuation. The remainder of the crew was taken to Vung Tau for treatment of shock and minor injuries. Helicopter fire teams were then ordered into the area to interdict any Viet Cong attempts to strip PCF 41, and a reaction force of one command element, one monitor and four FOMs from RAG 22 departed Nba Be at 2300. CTG 116.2 and the USN SEAL team were embarked. The reaction force arrived on the scene at 0300 on 24 May and found the PCF down by the bow about 30 degrees, heeled over to port about forty-five degrees, and about eight per percent submerged. The reaction force removed the one body along with the forward .50 caliber machine guns, the starlight scope and the remaining ammunition. An incendiary grenade was used in an attempt to render the mortar useless. An attempt was then made to tow the PCF from the sand bar where it had grounded, but severe bottom damage apparently suffered from the mine explosion occurring after the initial hit caused it to sink in midstream in about twenty-five feet of water. The reaction force marked the spot and then withdrew from the area. This was the second PCF lost to enemy action. On 24 May at 0430, a salvage unit composed of seven SEAL team divers, seven units of RAG 22 and VN Regional Force Company 999 departed Nha Be for the area of the PCF 41 sinking. The salvage unit, with CTG 116.2 embarked, arrived on station at 0820 and commenced operations. RF Company 999 landed and set up a defensive perimeter on the north bank of the Dinh Ba River while four RAG FOMs conducted reconnaissance by fire on the south bank. 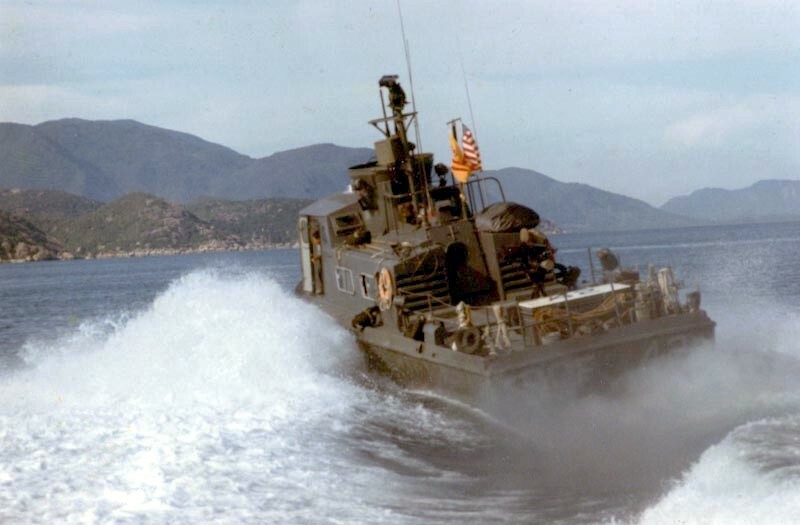 One LCVP with mine sweeping gear rigged was utilized in an expanding square search for PCF 41. At 0915 the LCVP exploded a Viet Cong mine, but no casualties were experienced. The search continued, but was unsuccessful in locating PCF 41. Due to the hazardous location and severely damaged condition of the PCF, salvage efforts were abandoned late in the morning. The same morning, Regional Force Company 999, operating on the north bank of the river, made contact with a Viet Cong unit of unknown size at 0937. In the ensuing action four Viet Cong were killed, one submachine gun, two carbines, and one B-50 anti-tank rocket launcher and two rockets were captured. Whether this weapon or a 57mm recoilless rifle dealt PCF 41 the fatal blow remains a matter of speculation. Later, during operation LEXINGTON II, several expended 57mm recoilless rifle rounds were discovered in the same area. David James Roberts, GMG3 2/67-11/67 Cam Ranh/Cua Viet ?Providence or Wickford, RI? Gerald (Nmn) Phillips, BM3 10/68-7/69 Cam Ranh Bay ?El Paso, TX? - PCFs 42 thru 48 were delivered to Cam Ranh Bay, from Subic Bay, PI, onboard the USS Tortuga LSD 29 on 17 April 1966. While offloading, at night, from the LSD, one boat suffered a damaged screw and four others had damaged skegs. - On 7 May 1966, PCF 42 came under fire from the beach. The forward turret gunner was hit on the flack jacket by small arms fire, incurring superficial wounds to the face and arms. At the time the USS Agerholm DD 826 was in the area on NGFS station approximately 800 yards away from the incident, and the wounded man was transferred to her for treatment. - On several occasions enemy gunfire confirms suspicious junk activity. The night of 29 June 1966, PCF 42 responded to an urgent request for gunfire support from the Van Ninh subsector of Khanh Hoa Province. Upon delivering 81mm mortar fire, the PCF received small arms fire from the beach. Van Ninh subsector responded to a reciprocal request from the PCF and 105mm howitzer fire at the Viet Cong shore positions. During the firing a junk attempted to leave the beach. The PCF closed, illuminated and attempted to hail the contact. The junk evaded back toward the beach and was taken under fire by 81mm mortar. Two direct hits were scored, sinking the junk and killing an estimated five Viet Cong. During the action PCF 42 continued to receive fire from the beach. After sinking the junk PCF 42 silenced the fire from the beach with machine gun and mortar fire. - On 22 July 1966, PCF 44 was assigned patrol area 4D, collided with an unlighted passenger junk 25 miles north of Nha Trang. The night was slightly overcast, with visibility of unlighted objects limited. The radar was in peak operating condition and the night observation device was in use, but no contact was established. As soon as the junk was spotted the PCF backed full and twisted, but in spite of her efforts collided with the bow of the junk. She illuminated the area immediately and put a swimmer in the water to bring survivors aboard. PCF 42, operating in area 4C, was called to assist; and VNN Coastal Group 25 units and Air Force and Army helicopters participated in the search. Search operations continued throughout the following day. Of the 25 passengers on the junk, only ten were saved; six bodies were recovered and nine persons were missing. - On 11 September 1966, PCF 42 observed two US Air Force F-4 jets collide in mid-air at night off the Cam Ranh AFB. PCF 42 immediately proceeded to the scene and commenced a search and rescue operation. PCF 82 also proceeded to the scene. Various parts of aircraft, classified maps and flight information, helmet, and remains of human bodies were recovered. - PCF's 3, 13, 23 and 42 were loaded aboard the USS Belle Grove LSD 2 on 29 November 1967, and then transported to the Naval Ship Repair Facility, Subic Bay, Republic of the Philippines. These were the first four boats, of an eventual 24, scheduled for out-of-country overhaul because of serious hull corrosion in the main cabin bilges. All PCF's scheduled for this program were to exit from and return to country from a centralized point at Cam Ranh Bay. All ordnance equipment was off loaded at Cam Ranh Bay, prior to departure for the yards and would be overhauled by the Naval Support Facility, Cam Ranh Bay personnel. PCF's going through the out-of-country overhauls were programmed to receive design improvements, in addition to the refurbishing of the existing equipment. Some of the more significant improvements to be implemented included a more reliable 24 volt electrical system, a higher capacity drainage system and installation of a more powerful AC generator. In the attempt to stop, or at least slow down the rate of hull corrosion in the remaining 62 PCF's not scheduled for these overhauls, a program was initiated involving the application of special anti-corrosive paint and placement of magnesium anodes throughout the bilges. - At 0700 on 10 May 1969, Coastal Group 26 inserted an ambush team just north of Ap My Hoi. At 0830, PCF 88 on normal MARKET TIME patrol received an urgent request from Coastal Group 26 for gunfire support and a dustoff aircraft to MEDEVAC two wounded, who were pinned down by heavy enemy fire. PCF 88 arrived on the scene at 0845 and after calling for a dustoff aircraft immediately began gunfire support. PCF 42 arrived on the scene 10 minutes later and provided additional cover fire. Air cover and spotter planes were called from Phan Rang to join the battle and drop smoke flares to mark friendly and enemy positions. Enemy fire was sufficiently suppressed to allow Coastal Group 26 elements to begin withdrawing. PCF 36, patrolling area 4F, was called in to join the fight. By 0930 PCF 42 and Yabuta junks began taking Coastal Group 26 elements aboard as they were out of ammunition and unable to defend themselves while being taken under enemy fire from the tree line beyond the beach. PCF 42 again supplied cover fire while Coastal Group 27 began inserting troops just to the north to assist in evacuating troops. At 0930 Coastal Group 27 troops came under heavy enemy automatic weapons fire from dug in positions as PCF 36 arrived on scene and immediately began suppression fire. PCF 36's aggressive attack was so continuous and accurate it halted all enemy fire; this was credited as a significant factor in reducing friendly casualties. Throughout the day PCF 36 organized and coordinated simultaneous strikes by five PCFs in column formation along the kill zone, attacking and then withdrawing to allow air strikes between attacks. At 1700 Coastal Group 26 concluded the mission and all Coastal Group 26 and 27 troops were withdrawn. PCF 36 ordered all PCFs to normal MARKET TIME patrols leaving PCF 82 and PCF 42 on station to provide continuous H & I fire throughout the night. From 0830 to 1700 the PCFs provided uninterrupted coordinated attacks utilizing continuous arms resupply by PCFs from Cam Ranh Bay. Coordination with strike aircraft was outstanding resulting in continuous heavy bombardment for the entire eight and one-half hour operation. The PCFs expended 13,559 rounds of .50 caliber ammunition and 544 rounds of 81mm mortars. There were two Vietnamese killed and four wounded while six enemy were killed (body count). Due to complete and overwhelming bombardment of the entire area, enemy casualties were probably far greater than actually counted. - In ceremonies on 31 October 1969, at the Vietnamese Naval Shipyard in Saigon, 13 PCFs were turned over to the Vietnamese Navy. The PCFs were numbers 11, 23, 42, 44, 47, 57, 58, 66, 67, 68, 91 and 100. They departed that afternoon for Qui Nhon and will commence MARKET TIME patrols in the Second Coastal Zone during November. The Coastal Surveillance Center, Qui Nhon is also scheduled for turnover to the Vietnamese Navy in early November. Lloyd Edward Jones, EN2 2/69-4/69 An Thoi Baltimore, MD ??? ??? - PCFs 43, 46 and 47 stopped an infiltration attempt by taking an enemy arms trawler under fire and destroying it, 29 February 1968. - On 10 October 1968, PCF 43 arrived at An Thoi, having completed its out-of country corrosion overhaul. - On the morning of 3 November 1968, PCF 36, PCF 43 and PCF 50, along with VNN Coastal Group 41 units, with a Regional Force embarked, carried out a raid up the Ong Doc river, 65 miles south of Rach Gia on the Gulf of Thailand. While PCF 36 remained a few miles from the river mouth to support a Regional Force sweep to the south, PCF 43 and PCF 50 proceeded to a point 10 miles up river to take suspected enemy positions under fire. Sniper fire was received killing the after mount operator of PCF 50. PCF 50 spotted the sniper and killed him as he attempted to escape. During the operation USS DuPont DD 941 and USCGC Ingram WHEC 35 provided 5-inch naval gunfire support. - On 20 November 1968, PCF 43 and PCF 82 provided emergency NGFS for Song Ong Doc Regional Force troops, sweeping Viet Cong positions near Area 9C. 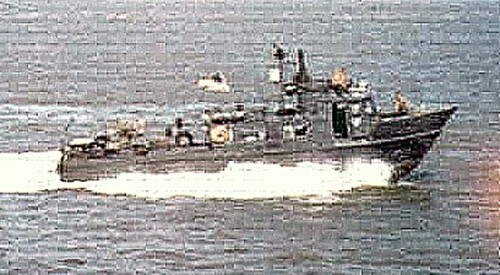 PCF 5, PCF 43 and PCF 82 made first entry into the Bay Hap river and transited to the remote outpost at Cai Nuoc village, killing 11 Viet Cong during the transit. The outpost was in danger of falling into the hands of the Viet Cong and had but a small supply of ammunition left. After supplying the outpost with needed ammunition, the PCFs exited the river, taking targets of opportunity under fire. The boats came under intense enemy fire while exiting, resulting in minor damage to all PCFs and 1 OinC wounded. The PCFs returned fire, killing an estimated 11 Viet Cong and destroying or damaging numerous sampans, structures and bunkers. - On 3 December 1968, PCF 10, PCF 43, PCF 88 and PCF 93 raided Viet Cong positions deep into the Cai Lon river and destroyed 15 structures, 17 sampans, 9 junks and killed 1 Viet Cong. The boats encountered hostile fire on 3 occasions when exiting the river, inflicting minor damage to PCF 10 and PCF 43. - On 27 December 1968, PCFs 3, 5, 9, 43 and 93 raided enemy positions in the Cua Lon river and Bo De river, destroying numerous sampans and structures and killing 1 Viet Cong. Enemy fire was encountered twice during the raid and 2 USN crewmen were wounded. - On 11 February 1969, 10 PCFs teamed with as LSMR, an LST, an MSO, a WPB, a WHEC, an airborne spotter, Air Force jets and Mobile Strike Force (MSF) troops to carry out eight hours of operations on the southern portion of the Ca Mau Peninsula, SEALORDS 308. After preparatory naval gunfire by USCGC Wachuset WHEC 44, USCGC Point Cypress and USS White River LSMR 536, the river incursions began at 1223. 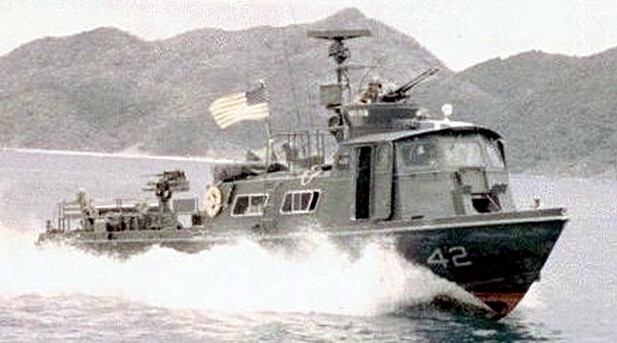 At the mouth of the Rach Duong Keo PCFs 43, 44 and 71 proceeded approximately 2.5 miles up river while 20 MSF troops swept up the east river bank. Also starting from the same point PCFs 3, 10 and 31 proceeded about two miles up the Trum Gong River for a psyops broadcast. At the same time 10 miles to the east-northeast PCFs 28, 53, 60 and 103 entered the Rach Nang and in just four minutes came under heavy hostile fire from the south bank, about one mile up river. With PCF 103 taking two rocket rounds in the port engine and PCF 60 hit in the bow below the waterline, all four craft turned back down river and cleared the mouth about 15 minutes later. Two men were slightly wounded in this engagement, one each from PCF's 60 and 53. The effort to save PCF 60, which was starting to settle by the bow, continued for over an hour. PCF 60 had to beach on a sandbar outside the canal to avoid sinking. The boat's flooding was brought under control, even though the bow had already gone below the surface, after a P-250 pump, provided by the Point Cypress, and delivered by PCF 44, was received. The boat was then temporarily repaired by its own crew with more permanent repairs being made later by the White River. The remaining undamaged craft assembled for another venture up the Rach Nang after the enemy positions were hit by air strikes and naval gunfire, in the early afternoon. At 1625 PCFs 3, 10, 31, 43, 44 and 71, with the MSF troops embarked, headed up river. The troops were landed at the river mouth and contact was soon made as PCF 71 took a rocket hit on it's port side. By 1630 the troops had surrounded the enemy firing position. In the ensuing fight two Viet Cong were killed and another probably killed before the enemy retreated up river with the MSF unit in pursuit, until darkness forced breaking contact. Despite vigorous attempts by the OinC and crew to control flooding and to beach PCF 71, it sank in 10 feet of water, only a half mile south of the river mouth. Units stood by PCF 71 and began salvage operations the following morning. Most of the electronic gear and the majority of weapons, including the 81mm mortar, were salvaged by the OinC and crew of PCF 44, despite some very dangerous sea conditions. The next day, 13 February, PCF 71 was successfully refloated by a salvage team. Other minor casualties were on PCF 10 where three crewmen were wounded by flying, broken glass from a shot out pilothouse window. Enemy losses to the PCF and MSF forces, that day, came to 27 bunkers, 20 claymore mines, 28 grenades, one structure, and one sampan destroyed; 2 AK-47 rifles captured and numerous bunkers damaged. One MSF soldier was wounded. - On the morning of 28 February 1969, PCFs 23, 43 and 94 entered the Bay Hap and embarked RF/PF's from Cai Nuoc for a probe of the enemy positions. Landing parties from PCFs 23 and 94 discovered fresh spider holes and much brass in the area as PCF 43 provided cover from the river. After EOD personnel destroyed two bunkers the landing parties were re-embarked for another probe three miles further up the river. Heavy small arms fire was met as the planned landing area was neared. With 30 troops on board each craft the three "Swift" boats responded immediately by turning toward and beaching opposite the enemy positions. This surprise maneuver caused the Viet Cong to stand and run, followed closely by the RF/PFs. As the action moved up river PCFs 23 and 43 followed and again came under hostile fire. Again the enemy positions were charged with PCF 93 joining in the action. With the RF/PFs already ashore this time PCF crewmen went ashore in pursuit of the enemy. During this phase of the action one Viet Cong was killed and his still loaded rocket launcher captured. Total results of the day's action included 30 sampans, 15 structures, 7 bunkers, 12 tons of rice, 1 still and 50 gallons of liquor destroyed; 2 sewing machines, 6 individual weapons, one rocket launcher, small arms ammunition, enemy psyops material, a man, a woman and a child captured; and 10 Viet Cong killed (4 by PCFs and 6 by RF/PFs). There were no friendly casualties and the "Swift" boats received only minor damage. 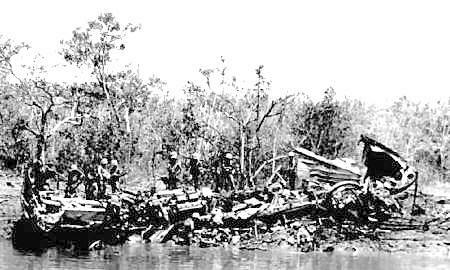 - The Cua Lon River was the scene of a raid that encountered hostile fire on 12 March 1969. PCFs 23 and 94 took MSF troops up river, where they were landed without incident and began moving to the west. At the same time PCFs 43 and 51 stood by to provide cover. As the sweep progressed PCF 51 probed north of the Cai Nhap Canal and PCFs 23 and 94 probed up the Cai Ngai River. Following these probes light small arms fire was received from the beach and was immediately suppressed. The three Swifts then headed up the Cai Nhap Canal where two of three water mines detonated, one throwing up a 50-foot column of mud and water. Heavy enemy fire was taken from both canal banks and could not be suppressed. The PCFs cleared to the south and picked up the MSF unit. The enemy positions were taken under mortar and artillery fire and air support was called in. A group of 20 additional MSF were brought to the mouth of the Cua Lon from the USS Washtenaw County LST 1166 by LCVP. They were taken by PCFs 43 and 94 up river to where a sweep lasting one hour sighted nine Viet Cong and detained one female suspect. Other results included five structures, 14 sampans and a large junk destroyed. Three of the PCFs received minor damage and one crewman was slightly wounded. - On the morning of 9 April 1969, PCFs 21, 23, 31, 93 and 103 entered the Song Ong Doc with Mobile Strike Force (MSF) troops embarked. As they proceeded up river, light small arms fire was received from the river bank. At a point seven miles up river, the force came under small arms, automatic weapons and recoilless rifle fire. One recoilless rifle round hit PCF 31 but failed to detonate causing only a small hole at the waterline. After suppressing the enemy fire and clearing the area , PCF 31 was escorted back to sea by two additional Swift boats sent up river. Strikes by Army LHFT and naval gunfire from USCGC Mendota WHEC 69 were placed on the enemy position. More small arms was encountered by the PCFs still on the river and the LHFT without friendly casualties. After leaving the river to rearm, the Swift boats proceeded 5 miles up river and put the MSF ashore on the south bank in mid-afternoon. Following the departure of these units from the river at the completion of the ground sweep, PCFs 22, 67 and 94 entered the river to establish night blocking patrols. 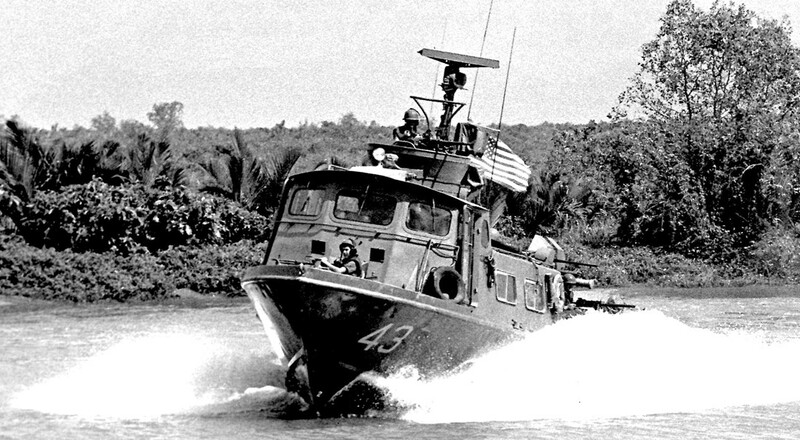 The purpose of the operation was to intercept Viet Cong which might attempt to head north across the river as they evaded the forces of SILVER MACE II operating to the south. Early on the 10th, PCFs 31, 38, 43 and 71 took over the continuing blocking patrol. At a point 6 miles up river PCF 71 received minor damage from a recoilless rifle hit and one MSF was wounded. Other than light small arms fire the patrols continued without incident until termination that evening. In addition to suppressing hostile fire, the Swift boats, MSF, LHFT and fixed wing aircraft took targets of opportunity under fire in what local authorities had declared a totally restricted zone along the river. Results included 17 structures and nine sampans destroyed, 15 structures and two sampans damaged and one Viet Cong killed in action. 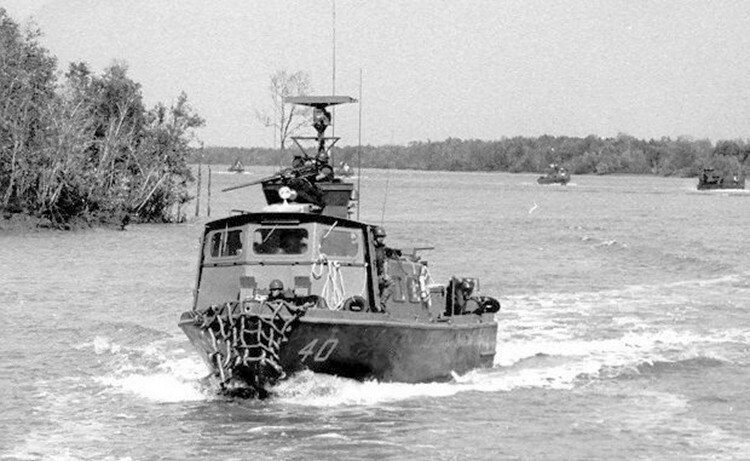 - Eight PCFs, with 6th Battalion VNMC troops embarked, sailed the Duong Keo River during the late afternoon of 12 April 1969, for a sweep operation in the day's objective area. At 1734, a large scale enemy initiated firefight, by an estimated two Viet Cong companies, was unleashed as the PCFs, in column formation, reached a position four miles upstream of the river's mouth. The detonation of two claymore mines, from the northeast bank, was immediately followed by intensive B-40 rocket, recoilless rifle, .30 and .50 caliber machine gun, rifle-grenade and small arms fire. PCF 43 was hit by recoilless rifle and B-40 rounds, which disabled her steering gear, and fatally wounded the boat skipper, LTJG D. G. Droz. The boat beached, at high speed, into the center of the ambush site, as B-40 rockets continued to smash into her. Uninjured crewmen and UDT personnel on board, set up a hasty perimeter around the boat as PCFs 5 and 31 returned alongside to assist the stricken PCF 43, at the same time maintaining a heavy volume of fire. Seawolve helicopters reacted in les than five minutes and also placed heavy machine gun fire into the area. Enemy fire was suppressed and all personnel were removed from PCF 43, while PCFs 5 and 31 cleared the area. Later, a fire in PCF 43 reached the UDT ammunition stores on the aft deck, creating an explosion which destroyed the craft. Final results of the disaster were three US Navy personnel killed, with 33 others wounded. Two Vietnamese Marines were killed, with another 13 wounded. One PCF (#43) was destroyed and two others were badly damaged. An additional two PCFs received moderate damage. Enemy losses were 18 Viet Cong killed (2 by body count and 16 estimated). W.P. "Sonny" Taylor Jr, RD2 swiftvet44@comcast.net 5/67-3/68 Cam Ranh Bay Oakland, TN - ?Wup? - At 0112 on 13 April 1967, the crew of PCF 44 spotted the crash of a US Air Force C-141 at sea, 13 miles south of Nha Trang. PCF 44 immediately commenced search and rescue operations and rescued two of the nine persons aboard. Later four US Army LARCs and PCF 42 with EOD Team 22 divers arrived on the scene and located the wreckage and aircraft's cargo of 13,000 pounds of high explosives. PCFs 43 and 49 and USS Embattle MSO 434 and other units also took part in the operation. 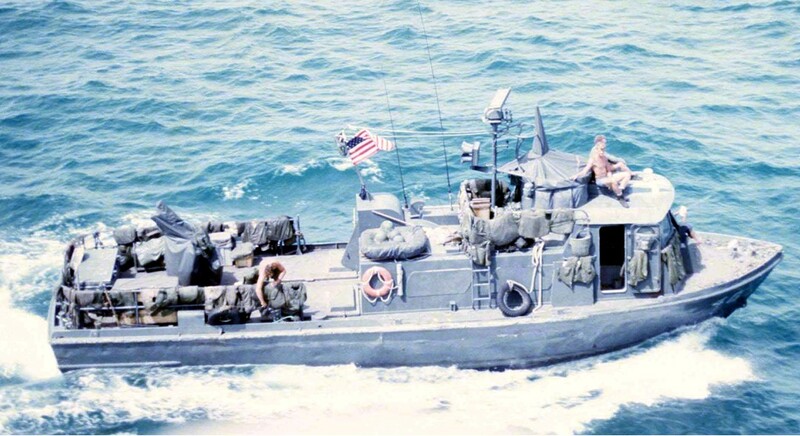 - Just after midnight on 12 July 1967, PCF 44 provided illumination fire for two Coastal Group 25 craft involved in an exchange with to Viet Cong sampans, 20 miles north of Nha Trang. Six Viet Cong were killed during the engagement. Two Coastal Group sailors were killed by the enemy's fire and a third, seriously wounded, was evacuated to Nha Trang by the Swift boat. - On 13 October 1967, in response to a Coastal Group 25 request, PCF 44 medevaced a Vietnamese child who had been seriously wounded in the foot by an accidental discharge of a firearm. The child, accompanied by her father, was taken by the Swift to the medical facility in Nha Trang. - PCF's 5, 37, 44, and an unknown fourth PCF, were loaded aboard a US Navy LSD on 20 December 1967, and then transported to the Naval Ship Repair Facility, Sasebo, Japan for out-of-country overhaul because of serious hull corrosion in the main cabin bilges. These were the first boats to be overhauled at the Sasebo, Japan Naval Ship Repair Facility. PCF's going through the out-of-country overhauls were programmed to receive design improvements, in addition to the refurbishing of the existing equipment. Some of the more significant improvements to be implemented included a more reliable 24 volt electrical system, a higher capacity drainage system and installation of a more powerful AC generator. In the attempt to stop, or at least slow down the rate of hull corrosion in the remaining 62 PCF's not scheduled for these overhauls, a program was initiated involving the application of special anti-corrosive paint and placement of magnesium anodes throughout the bilges. - PCF's 5, 37 and 44 returned to Cam Ranh Bay on 30 April 1968, from out-of-country overhaul on in Sasebo, Japan on board the USS Comstock LSD 19. - On 9 December 1968 boat transferred from Cam Ranh Bay to An Thoi. - On 13 December 1968 boat transferred from An Thoi to Cat Lo. - On ? January 1969 boat transferred from Cat Lo to An Thoi. - On 8 June 1969 boat transferred from An Thoi to Cam Ranh Bay. - In August 1969, a ceramic gunshield was installed on mount 52 for evaluation. The disadvantages of restricting the movement of the .50 caliber mount, with the after pin removed, the restricted viewing area, due to the height of the shield, and the fact that it was a one shot item, that would have to be replaced after any damage, ruled out any further installations. Francis Leem Carly, EN2 4/66- ?? Cam Ranh Bay ?Clay, MI? Robert Lyle "Bob" Blecha, RMSA/SN 4/66- ?? Cam Ranh Bay ?Bellevue, NE? - On 6 June 1966, USS Fortify MSO 446, USS Dynamic MSO 432, PCF 45 and PCF 51 conducted SAR operations following a collision between two Vietnamese civilian junks off Ban Than Point, just north of Nha Trang. Five survivors were recovered. - On 9 June 1967 boat transferred from Cam Ranh to Chu Lai. - While in a daylight WaterBorneGuardPost position on the Khem Bang Co, 82 miles southeast of Saigon, 4 September 1970, PCFs 45 and 48 received automatic weapons fire from the north bank of the canal. The units made two firing runs and mortared the area of the ambush. One crewman was slightly wounded. - On 12 November 1970, PCFs 45, 87, 97 and 692 entered the southern mouth of the Rach Eo Lon and inserted KCS troops. The PCFs fired H&I at suspected enemy positions. At least two (2) tons of ammo was captured and destroyed. PCFs 692 and 45 were taken under fire with B-40 and small arms. Black Ponies were scrambled to assist. KCS captured one B-40 shoulder launcher. PCF 87 was ambushed while proceeding out of the Eo Lon canal, 12 November 1970. One (1) B-40 rocket hit the after conning station killing two (2) KCS troops and wounding two (2) US sailors (one was medevaced to the 23rd BVAC hospital), one (1) VNN crewmember (also medevaced) and one (1) KCS. - This was the last incident, of the Vietnam conflict, where a US Navy swift boat was damaged or a crewman was injured. Tour PCF 45, visit with her crew and view some of the sites they all saw and experienced in 1967 and early 1968. Visit Bob Shirley's PCF 45 website and relive those days in South Vietnam! Vu Huu Dung, Trung Uy, OinC 4/70-?? - On 17 June 1966, PCF 46 observed an unidentified aircraft collide with the water about 3 miles southeast of Cape Varella (CQ 3725). PCF alerted the Coastal Surveillance Center Nha Trang, USS Fortify MSO 446 and PCF 54 in the adjacent Op-area 4D. Upon arriving on the scene, fuel was still burning on the water and PCF 43 made a quick search of the probable flight path and the perimeter of the fire. When the fire was reduced to burning bits of fuel soaked flotsam, PCF 43 entered the crash site looking for survivors and attempting to identify the aircraft. One body, flight and radio logs, and many large identifiable pieces of aircraft were recovered. The aircraft was subsequently identified as an Air Force C-130. The MSO arrived on the scene and assumed on scene commander about two hours after the crash. All units, MSO 446, PCFs 43 and 54 continued searching the area for about 15 hours. One large oil slick was discovered and presumed to mark the position of the aircraft. The depth of the water was over 26 fathoms. - On 31 July 1967, the OinC (crew 25A) onboard PCF 49 that day, received a serious wound in the stomach from an evading junk. At about 0530 PCF 49 spotted an unlighted junk about 300 yards off its port bow. When attempts to stop the junk with siren and spot light failed, the OinC stood in the pilot house door and fired AR-15 warning shots across the bow. When the junk still did not stop, the OinC fired another volley of AR-15; this time the junk responded with a burst of fire from automatic weapons. Almost immediately the OinC was hit in the stomach. Radar contact with the junk was then lost as PCF 49 medevaced its OinC to the USS Sanctuary AH 17 and later medevaced back to CONUS. The USS Morton DD 748 was notified of the incident, regained radar contact with the hostile junk and destroyed same. Crew #25A was transferred back to Cam Ranh Bay, Crew #40A departed Cam Ranh Bay on 2 August 1967 as replacements. - In mid 1967, in an experiment to improve hull design, PCF 46 was fitted with a 360 lb bow extension. This modification reduced pounding characteristics and the amount of water taken over the bow in rough weather. Initial tests were encouraging but required further investigation before final evaluation could be made. The bow extension was removed during overhaul. Richard Paul Baker, LTJG, OinC 6/28/68-? Cam Ranh Bay Carnegie, PA - ?doctor? - At 1630 on 16 April 1967, PCF 47, while participating in the salvage operations at a US Air Force C-141 crash scene, sighted the flames and smoke of a downed helicopter, five miles south of Nha Trang. The PCF proceeded to the scene with two Air Force divers and located the wreckage. None of the four men in the helicopter survived. The salvage efforts, which resulted in the recovery of various pieces of equipment and personal items, were terminated at 1800 on the 17th. - On 3 October 1967 boat transferred from Cam Ranh to Cua Viet. - PCFs 36 and 47, PT Banks and Spooky 61 provided continuous, intense covering fire, while evacuating nine (9) VS Army personnel, surrounded by Viet Cong, 20/21 January 1969. - On the night of 15 August 1969, PCF 47, while on normal MARKET TIME patrol, received information of known VC coastal transit routes from the Tuy Phong Intelligence Officer. The Swift boat proceeded to a point about five miles northeast of Tuy Phong, shut down it's engines and established a surveillance position close to the beach. Shortly a craft was detected on radar and later captured, resulting in four persons being detained. One offered 2,500 piasters for their release. A later report from the Tuy Phong Intelligence Officer stated that one detainee was the Binh Hai District Head VC Recruiting Officer and the other three detainees had just been recruited. George A. Hoover, BM2 4/66-?? Cam Ranh Bay ?retired BM1 7/15/69 - was from Washington? Donald Stephen Wilson, EN2 4/69-7/69 Cam Ranh Bay ?Richmond, TX? - PCFs 42 thru 48 were delivered to Cam Ranh Bay, from Subic Bay, PI, onboard the USS Tortuga LSD 29 on 17 April 1966. While offloading, at night, from the LSD, one boat suffered a damaged screw and four others had damage to their skegs. - On 17 June 1966, USS Fortify MSO 446 and PCF 51 conducted SAR operations at the scene of a Navy C-130 crash north of Cam Ranh Bay. No survivors were found. - On 28 September 1967 boat transferred from Cam Ranh to Cua Viet. James D. Gray, BM1 3/67-?? Cam Ranh/Chu Lai ?was from Texas? Robert Stephen Craig, EN2 10/68-2/69 Qui Nhon ?Sudbury, MA? Alphana Bernard Hobbs, BMSN ahobbs@ec.rr.com 2/69-6/69 Qui Nhon Jacksonville, NC - ?Doctor? - PCFs 49 thru 54 were delivered to Cam Ranh Bay, from Subic Bay, PI, onboard the USS Colonial LSD 18, on 27 April 1966. - On 11 June 1967 boat transferred from Cam Ranh to Chu Lai. - On 20 June 1967, an explosion on board a US landing craft unloading ammunition at Duc Pho blew crew members into the water and started a fire which spread to the nearby ammunition supply point. Four MARKET TIME craft -- PCFs 49, 51, 54 and 60 -- were dispatched to the scene to conduct search and rescue operations. Despite a series of secondary explosions which hurtled shrapnel as far as 1.500 yards from the beach, the PCFs moved in and rescued 11 persons from the water. PCF 49 sustained minor hull damage during the mission, and two of the crew were wounded, one seriously, while crewmen pulling wounded personnel onboard, another explosion occurred and blew out the starboard boat windows injuring the OinC. He was medevaced to CONUS and never returned. - On 31 July 1967, the OinC (crew 25A) onboard PCF 49 that day, received a serious wound in the stomach from an evading junk. At about 0530 PCF 49 spotted an unlighted junk about 300 yards off its port bow. When attempts to stop the junk with siren and spot light failed, the OinC stood in the pilot house door and fired AR-15 warning shots across the bow. When the junk still did not stop, the OinC fired another volley of AR-15; this time the junk responded with a burst of fire from automatic weapons. Almost immediately the OinC was hit in the stomach. Radar contact with the junk was then lost as PCF 49 medevaced its OinC to the USS Sanctuary AH 17 and later medevaced back to CONUS. The USS Morton DD 748 was notified of the incident, regained radar contact with the hostile junk and destroyed same. - On 30 October 1967 boat transferred from Cam Ranh to An Thoi. - On 9 April 1968, PCF 49 received hostile fire from the shoreline in Area 9H, resulting in minor damage to the PCF. - On 22 April 1968, sailed to Cam Ranh Bay for out-of-country corrosion overhaul. - During the latter part of 1969, PCF 49 was equipped with its own gig, a basket bottom sampan, complete with a painted silver arrow, broken with a "49" in the middle. It was used in at least one night ambush operation, in the Degi area of RVN Coastal Group 21, north of Qui Nhon. - On the morning of 29 September, PCF 49 patrolling in MARKET TIME area 3G was informed of a possible search and rescue mission about 14 miles southeast of Qui Nhon. An emergency beeper signal had been picked up by an aircraft on patrol. Investigation by the "Swift" boat revealed the emergency beeper to be aboard a small Vietnamese fishing vessel. The fishing vessel was then brought along side USCG Taney WHEC 37 for questioning of personnel by the VNN liaison officer aboard the cutter. Interrogation revealed that the fishing boat had been in the area since 281800H and at approximately 290530H discovered the radio in the water and brought it aboard. They further stated they had seen no aircraft crash or any indication that one had crashed. Two Vietnamese were detained and transferred to PCF 49 for transportation to Qui Nhon for further interrogation. - Boat departed Qui Nhon 25 October 1969 for Saigon and turnover to the Vietnamese Navy.